We’ve got a cold drink waiting for you at the Welcome Center! 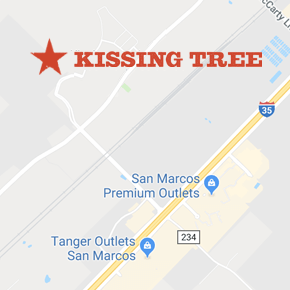 There’s a lot to do and see during your visit to Kissing Tree, including touring eight model homes and exploring the 20-acre amenity campus. Whether you’re looking to experience a day in the life of a Kissing Tree resident, or simply tour the model park, our New Home Specialists can help customize your visit. Give us a call at 512-539-3700 or complete the form below to schedule a personalized tour with a Community Host. We’ll get you all set up! What are you interested in?Touring the Model HomesGrabbing a drink in the biergartenTeeing up at the Golf CourseAttending a lifestyle eventSeeing all the outdoor amenitiesChecking out the quick move-in homesI want to do it all! Our New Home Specialists, Emma and Jill, are your personal concierge to help you discover all that the community has to offer. Please give them a call at 512-539-3700 if you need assistance.